The crossover will be the first Mini with awd, four doors and four full-sized seats. DETROIT -- BMW AG's Mini unit unveiled its Beachcomber concept, with an open body, all-wheel drive, an elevated seating position and a rugged appearance. The Beachcomber hints at the styling of the Countryman crossover, which goes on sale in Europe this year and in the United States in 2011. It will be built by Magna Steyr. Separately, Mini executive Ian Robertson said the Mini Cooper Coupe and Roadster are still two years away from production. “Those two models will double the number of models in the Mini portfolio within two years,” Robertson said here today at the auto show. He is the BMW board member in charge of sales and service. “By introducing new products and opening up new segments, Mini stays at the leading edge of the premium small-car segment,” Robertson said. Robertson also said Mini will extend by six months its lease program for the Mini E electric car. That program was launched last year and originally scheduled to run only six months. 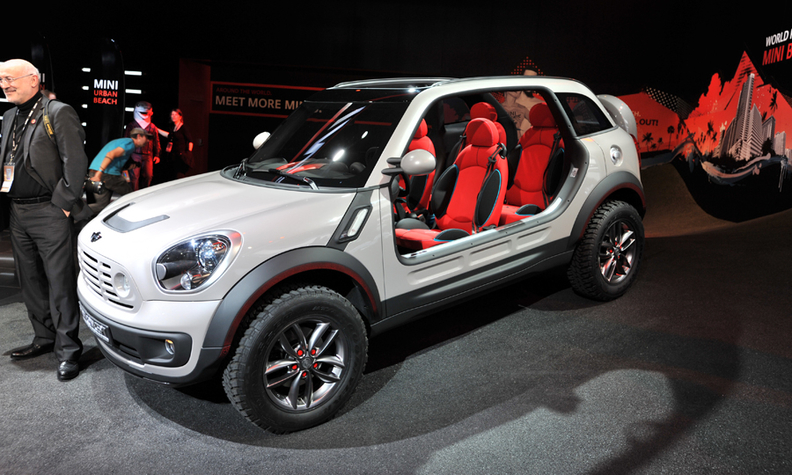 Robertson told Automotive News that Mini plans to add 17 U.S. dealerships over several years to the current 90. The total should exceed 100 by year end. Mini's worldwide sales fell 7 percent last year to 216,000.